Everybody can enjoy the feeling of paddling in a kayak. To make a good start you need good equipment and instructions to help you with the basics for a nice kayak tour. 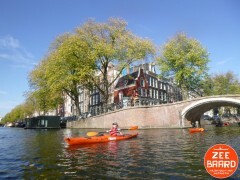 That is why Zeebaard organises kayak tours with instruction; active and close to nature. You will learn several techniques that help you to handle the kayak with confidence and feel safe in the boat. What is offered is the perfect balance between recreation, touring, and learning techniques. Zeebaard organises tours of different lengths, each with its own character: from paddling in a green and flourishing lake area full of birds, to a canal tour in downtown Amsterdam. 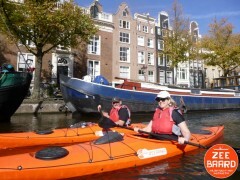 Zeebaard organises tours in all areas that are safe for paddling at all levels, from beginners to advanced. Safety always comes first. 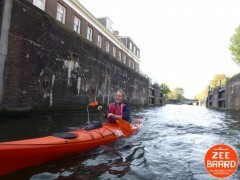 Zeebaard, founded by Maarten Mastbroek, started organizing kayak tours since the spring 2014. Since Maarten was introduced to kayaking he is an avid paddler. 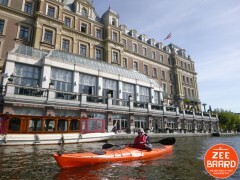 He is experienced in kayaking at all kinds of water from downtown canals in his own town, to sea kayaking at highlights like Grevelingen and the Wadden Sea, and everything in between.